We hadn’t been to Martha Clara in years, mostly because it has a very successful and busy tasting room and we tend not to enjoy crowds. So we figured we were pretty safe on a random and chilly January Saturday. However, there were many, many people there! 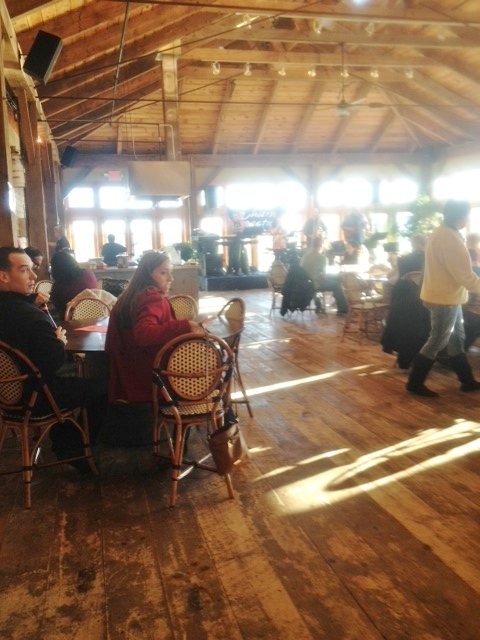 Fortunately, most of them were in the large performance space next to the tasting room, sitting at tables, enjoying the music of a band named Chain Reaction, which was covering songs from Lady Gaga to Michael Jackson. That room also offers a menu of panini and other light snacks, so you can get a glass, half carafe, or bottle of wine (about seven wines were “on tap”) and enjoy the music while you eat and drink. Martha Clara, owned by the Entenmann family of bakery fame, tends to offer many different events, including comedy nights. They also have a small menagerie of animals one can visit, including goats and at least one llama. 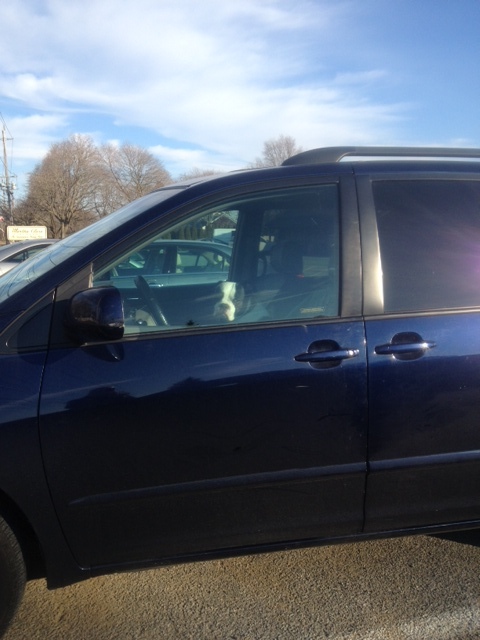 They also assert they are pet friendly, and leashed dogs are welcome, and we did see at least one dog in the tasting room, but we saw a very sad-looking pooch in the car next to us as we parked. You enter Martha Clara’s large rustic-looking building through the gift shop, which is fairly large and features spectacularly ugly items as well as some very nice things, plus a refrigerated case with cheeses, etc. The tasting room has several long bars, and there are French posters on the walls. There are three tasting menus: Barrique, $10 for five wines, including both reds and whites; Aromatic, $10 for five white wines; and Reserve, $12 for five of their better wines. We opt for one Aromatic and one Reserve, and tell the chatty and cheerful server that we will be sharing. Unlike in some places, she does not alter the order of the wines to accommodate our sharing, but pours each in the prescribed order. However, we are able to modify the sipping order ourselves, based on the thumbnail sketches she gives of each wine. The Reserve selections are marked with an asterisk *. We start with one of their sparkling wines, made from chardonnay grapes. It is light and semi-dry, with a bit of green olive aroma and some unripe pineapple notes. This would be a good choice for a sparkling wine to have with food, such as a chicken in a cream sauce. We allowed this to stand while we tasted the Blanc de Blanc, which turned out to be a good idea, since this, and all the other wines, both white and red, are served a bit too cold for in-depth tasting. In fact, the room itself is rather chilly. We find the aroma of fresh-cut grass preferable to the somewhat funky taste of this wine, which has a rather sour finish. Not one I would care to drink. This is a grape one rarely finds on Long Island. The wine has a honeysuckle aroma and is both tart and sweet. Light, it would make a pleasant summer sipper on the porch. This is their only oak-aged white, and has, our server notes, won many medals, and one can smell the characteristic aromas of oak and vanilla. The taste has lots of vanilla as well, with a butterscotch finish. It would be good with spicy food, such as Indian curries. Pinot Grigio is my go-to wine when I have to order a glass from that familiar neighborhood restaurant litany of Chardonnay, Sauvignon Blanc, etc., as it is usually pretty reliably potable, and not too sweet. Martha Clara’s Pinot definitely fits that description, as it is good, with some tastes of citrus and pineapple, and would be drinkable either with food or just for sipping. If we needed a white at home I could see buying this. Steel fermented, with aroma of peaches and some citrus flavors and nice fruit, this is a buyable white, and we like it better than the barrel fermented chardonnay. This is one of the wines on tap, and we notice our server dispensing it from the tap rather than a bottle. Both the aroma and the taste remind us of very ripe pineapple, though the server mentions lemongrass as a flavor. It’s also a bit pleasantly petillant. We have let this sit while we have the chardonnay and the viognier, but it is still somewhat too cold. Long Island merlots tend to have a tobacco aroma and a blackberry taste, and this wine does, too. It has enough tannins that it may last a few years and be better for it. Our server explains the name: it is the address of the tasting room. She also says that this is their best red, and it is a not entirely traditional Right Bank Bordeaux. 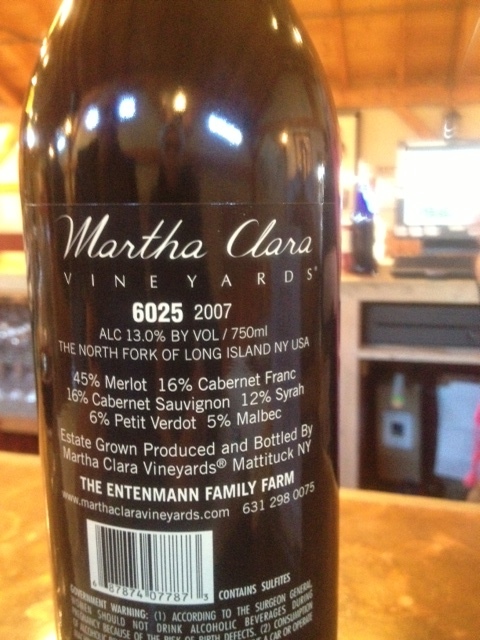 6025 combines 45% Merlot, 16% Cabernet Franc, 16% Cabernet Sauvignon, 12% Petit Syrah, 6% Petit Verdot, and 5% Malbec. The aroma is of raspberries and other red fruits, and the taste is nicely fruity with a dry finish, but does not seem worth $40 to us. At the end, there is a slight undertone of sawdust. Hello, Pesach! This dessert wine, in a slim bottle, tastes remarkably like Cheracol cough syrup or red candy. As we’re getting ready to pay and leave, the server comes over with one more taste, and tells us they’re giving a free extra taste to everyone. I’m glad the taste is free, because this sour watery wine is one I wouldn’t buy in a million years. Reasons to visit: lots of agritainment, with both children and dogs welcome; Blanc de Blancs, Pinot Grigio, steel fermented Chardonnay, Viognier.